The tangibility of paint and a certain loose-handedness with the brush are the prominent traits found in the work of Farrell Brickhouse. There’s the sense that each painting is strived for, worked out …hard won. But not only is he contending with paint in the painterly tradition, Brickhouse is also dealing with the enchanting qualities that his pieces exude; it’s as if he’s imbuing his subjects with lightness and grace. 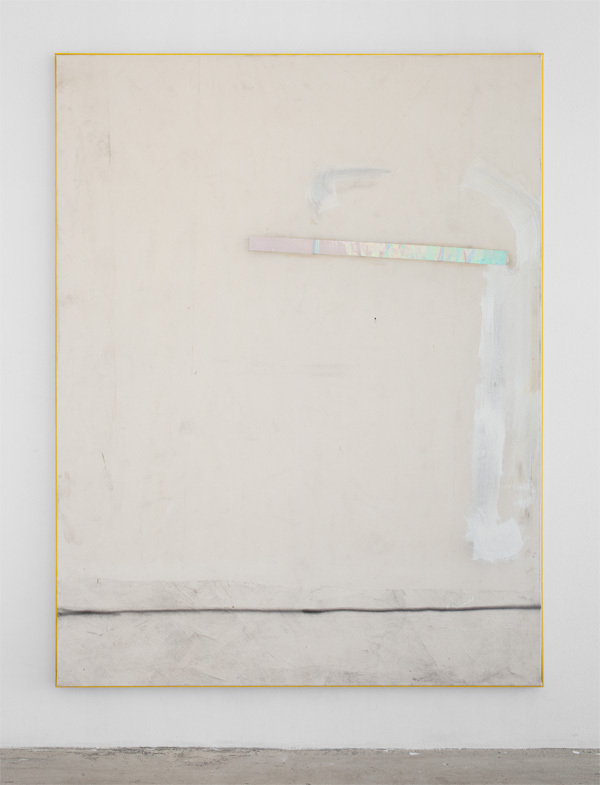 It’s that aspect of his work that has me hooked, not just how the paint appears. In trying to pin down the specific quality that I’ve felt, I want to use the word “charming,” but another part of me says that I should embrace terms like: captivating, beguiling and mesmerizing when trying to assess the thoughts and feelings that his works induce. PB: What I like about your work is the paint handling, coupled with a color usage that’s wide open—the same things I appreciate in the work of Soutine and Avery. Can you tell me a bit about your influences? FB: I greatly appreciate the effort you've put in to become familiar with my work and I think you've made perceptive observations of what is important to me, especially about achieving grace in my painting. A fellow artist used the term "tertiary palette" in describing recent work of mine. I liked that. Influences are many as they are for most of us. First, I remember as a child, going to the Museum of Natural History in NYC and seeing those dioramas, these worlds cast in a dark corridor—each one opening on something "mesmerizing," to quote you. I've sought that in my work, each painting is to be this illuminated world/object. Soutine did that with this gritty light and those jewel-like moments that come out of paint being pushed into paint. 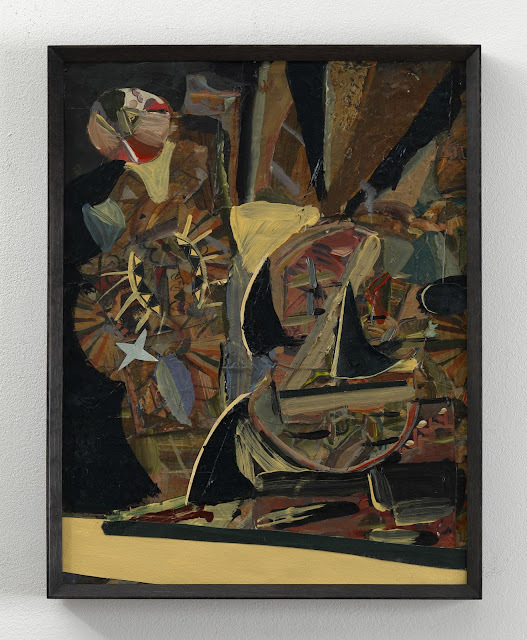 There was that great group show awhile back at Cheim & Read of Soutine and His Influences. Georges Rouault’s Christ Before Pilate - 7.25 x 5.2 inches is just sublime. At Queens College, Charles Cajori was a wonderful instructor to me. As a young man, my friend Ralph Hilton and I were roped together, sort of to say, working on each other's paintings and sharing what it was to live the life of an artist. There was something so exciting about what two can do next to a solitary painter. Also, spending several years fishing off Montauk in the late 70’s before deciding to return to NYC and give it another shot …Joseph Conrad said, “If you would know the age of the Earth, look upon the sea in a storm.” As I matured, art history offered different lessons and my influences would sound like the usual suspects. 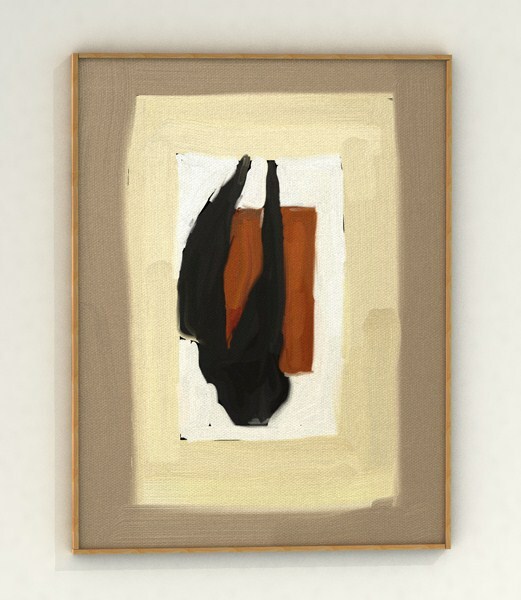 There are also the early paintings of Eva Hesse, the humanity of early Greek and Roman frescoes and also African American vernacular art mostly seen in a book called Souls Grown Deep. Influences are also those that confirm one is on the right path, not necessarily something one is drawing from formally, but as a territory worth inhabiting—someone like early Peter Saul. And NYC in the 70’s was quite a unique world and the city still is such an influence, this vibrant community of artists making such a passionate commitment to a life in the arts …one had better make the best thing possible. Of course, traveling a bit and seeing something of the world excited and expanded my art. PB: The specific way in which you work—which feels like an exploration with paint—is evident. Can you shed some light on your studio practice and your experiences there? My studio time is not unique, it runs the whole gamut: from the workman-like strokes that one makes until something more significant can happen, to the terrible certainty that it is all collapsing and one should just buy a boat and be done with it. There are the moments when I come alive; the marks seem determined, as if they always existed, and I am witnessing the process unfold—and all that one knows seems to be available in this illuminated moment. One also learns when to stop and step out of the trenches and look for a while to see what has been achieved, especially after the novelty wears off. Sometimes it’s a way forward that’s been rendered and sometimes one is rewarded with a decent work. PB: You’re on the faculty at SVA (School of Visual Art). How do you approach teaching? FB: SVA has provided me with a wonderful place to work. I’ve been there since 1980 in the Undergraduate Fine Arts Department. Teaching is about being a conduit for the student, to provide a route to him- or herself. We offer a safe place for them to learn and to fail and make what they need to make at this time in their emerging careers. We endeavor to turn them into Students worthy of the name. I offer them my passion, my knowledge of how to work, the belief that art is a language, that the function of language is to allow us to speak, and that art comes from a life lived. Students learn when they realize that the tools we are offering will enable them to get to where it is they want to be. It happens on all fronts, the entire expanse of being an artist—and faculty members can be an example that it can be done, that a life in the arts is possible. It’s such a privilege to share one’s hard won experience and be in a dialogue with young people, to be relevant. It is a vibrant part of my life and informs my own practice. We are all eternally students if we are artists. PB: Who are some other artists whose work you’re excited about right now? FB: There is the beloved Kathy Bradford… I believe there are synchronicities in the air, shared stories and images born of what it is to be alive now and that her work is terrific. Jennifer Wynne Reeves makes me feel like a barbarian, in a good way. 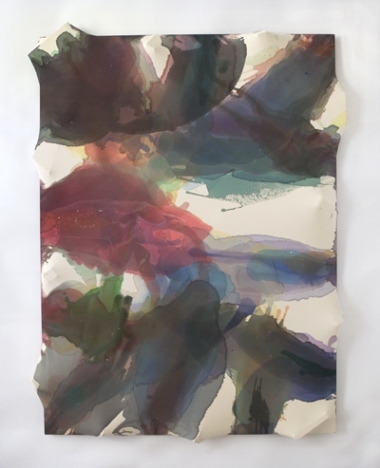 Peter Acheson, Peter Gallo… so many younger artists are excited about paint, what it allows and what it can speak to and that is encouraging. My Facebook community is really rewarding. I know I am leaving out many fellow travelers. I like what John Yau is writing about too. PB: What other things out there fuel your work and progression? FB: I am not sure about “out there.” At this point in my life there seems to be a turning inward, a focusing on my work that keeps unfolding and a censorship on what I let in, even as I feel more connected than at any time in quite awhile. The miracle of a life with my wife—my muse, the upstate NY land we go to as a sanctuary… traveling and seeing the courage that people all over the world display in seeking justice makes me believe my task is to be as courageous as possible in the studio. I do want to see what the scope of my art can speak to: personal experiences, current events and history. Recently, I feel that good work is somewhat like a time machine. It opens up one’s past body of work to new interpretations and significance, and allows one to claim new territory for the future. My career has been up and down and then some. With the new technology of sharing and a turn in the currents, I have another run going. I feel painting now is crisscrossing old borders with passion, wisdom and abandon to make work that resonates. Our political, financial, religious and even scientific leadership has mostly failed us at this moment in history. I think the re-emergence of painting today is tied to the need to create our own mythologies and to document the depth of wonder at the terrible beauty of this existence. Thanks Mike. 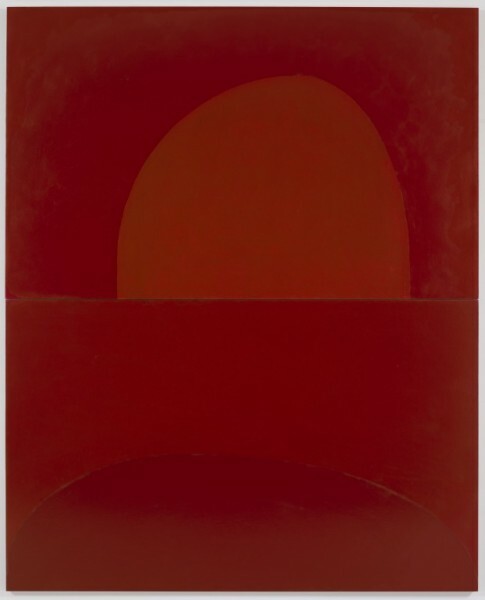 version 13, 2010, oil on linen, 2 panels. overall: 108 x 87 3/8 inches (274.3 x 221.9 cm). 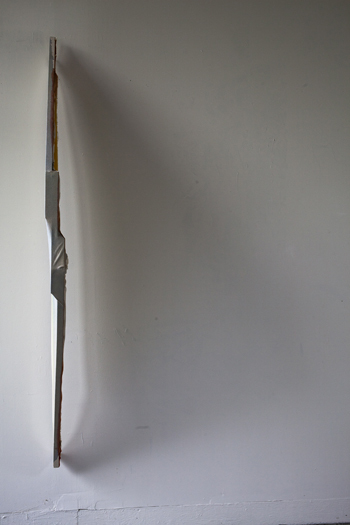 Untitled, 2011, oil, acrylic, and paper bags on canvas, 20" x 16"
Untitled (Stand), 2011, acrylic, unprimed canvas, wood, 61.25" x 28" x 5.75"
Altered stretcher bars, torqued and triangulated planes, backs as fronts—the work of Maria Walker is a lesson in harmonizing tradition and experimentation. But the path she’s taken hasn’t been an easy one. 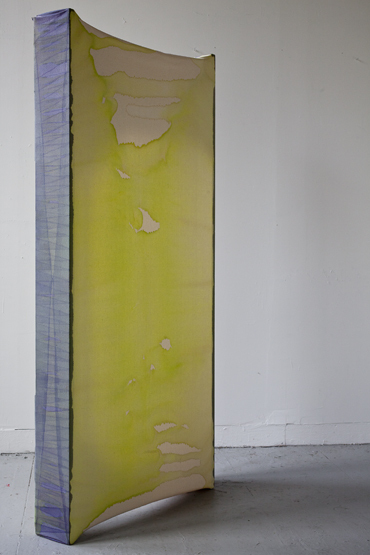 She has pushed her materials and flowed with them in order to elicit a distinctive sense of aesthetic truth. 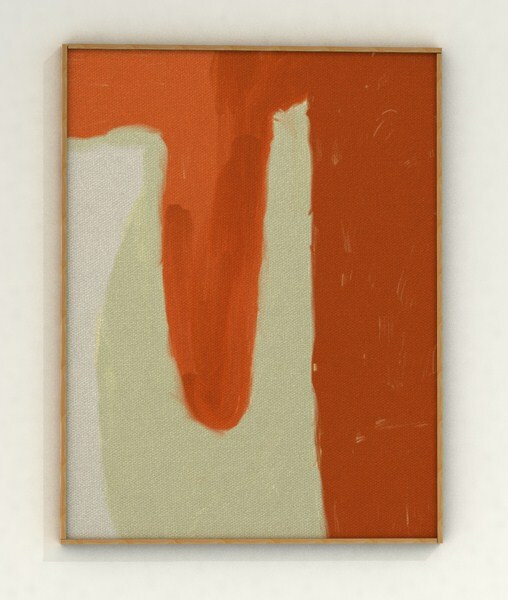 Many of her paintings involve dense soakings of pigment while others have a reworking of the stretchers that gives them the ability to stand on their own without being wall-mounted. 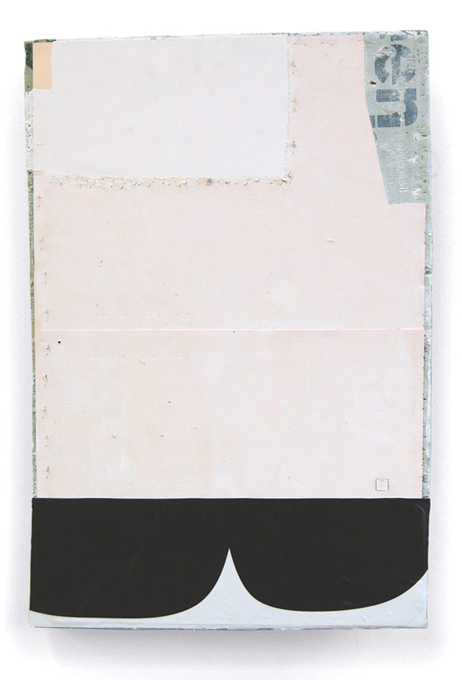 A few pieces involve no canvas at all, which obviously changes how they’re approached and perceived. Through all this exploration, there’s a sense of sureness that surrounds what I consider challenging and thoughtful work. In the interview that follows, Maria offers concise insights into her working philosophy and the work itself. 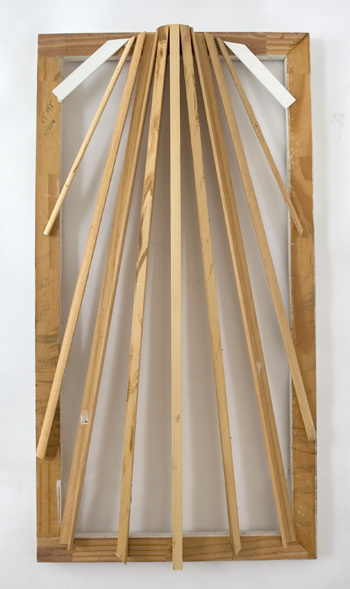 Summer - Summer Solstice, 2011-12, acrylic, unprimed canvas, wood, 65.5" x 49"
Return, 2011-12, wood, 42" x 22"
Untitled (Orange and Blue), 2011, acrylic, unprimed canvas, wood, 16" x 14.25" x 4.5"
PB: Your work struck me as entertaining questions of image and object. What’s your personal take on it? 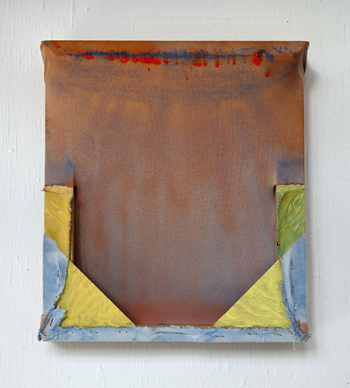 MW: I approach my paintings as objects. I think of the wood, the canvas, and the paint in terms of their physicality, and I work to find a balance of these elements through my interaction with them. Images in the work arise as a visualization of this exploration. When a painting is successful or good, the image is integrated as an essential, necessary aspect of the object. The danger is when/if I indulge too much in the image aesthetically, making choices that take the painting away from its physical being. 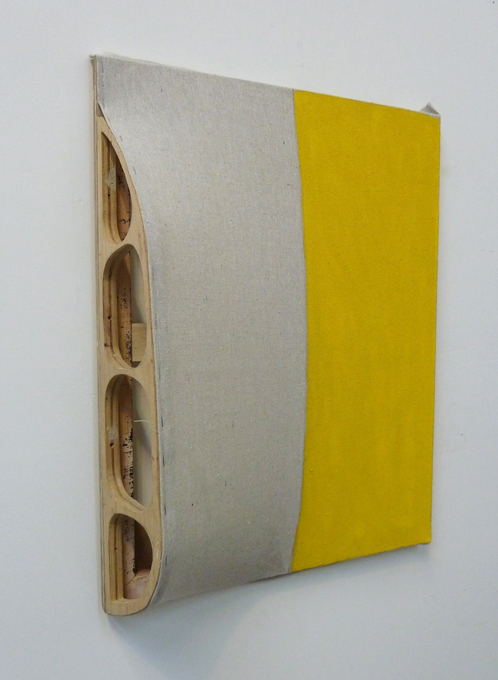 By closely considering the wood (the stretcher), the cloth (the canvas), and the paint, each element keeps the other two in check, questioning and verifying the necessity, directness, and clarity of each part. PB: As you’ve looked around through recent and longstanding art history, whose work has made an impact on you? MW: Two people specifically stick out in my mind. The first is Matisse, in particular the complex balance between lightness and rigor in his work. His paintings breathe with color, air, space, and joy, but as an artist he worked for each painting. There is honesty in his paintings, at times failure, but always pushing forward, very brave and open. He is one of the artists I remember first seeing as a child. His cutouts made clear sense to my child mind. 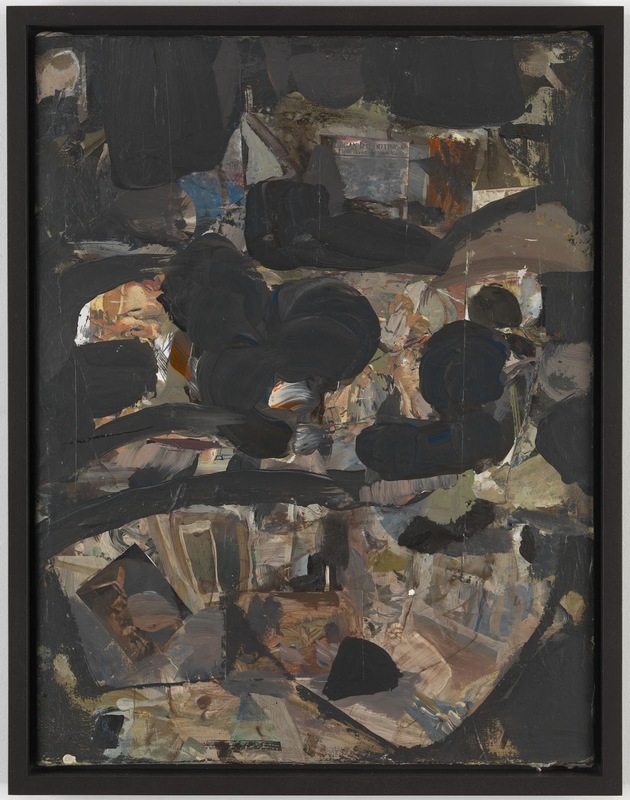 In grad school, looking at his paintings helped me face and embrace the very difficult growing pains of pushing open my work. Second, I think of Donald Judd at the Chinati Foundation in Marfa, Texas. I went to Marfa with my graduate school class, and to see that work in the context of the vast, empty Texas landscape blew my mind. I grew up in the flatness of Ohio, so I was really excited to see artwork that met that landscape so directly. Seeing his work helped me think about space, directness, and scale in my own. There were bells and whistles I could shed that allowed the work to step forward with more clarity. PB: What challenges and considerations have you run into because of the experimental nature of working with canvas in this way? 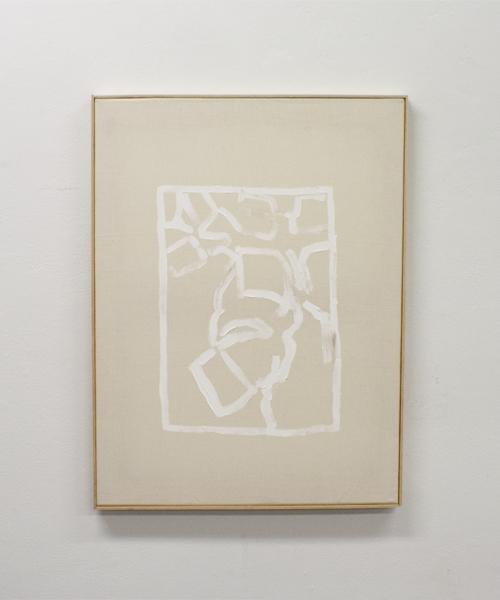 MW: I work with the unprimed canvas because when the paint soaks into the cloth it becomes a part of it, part of the object itself, rather then sitting on top of the surface. Unprimed canvas is a challenge because it is not protected in the way that it would be with traditional oil paintings. So I take pains to keep it protected and clean (which is difficult in a small studio with a saw!). But these are objects, and eventual accumulation of wear may become visible, and that will become part of what it is. If it is a good painting, that shouldn’t matter. PB: Have you found yourself thinking more about the canvas and its needs rather than just the pigment and what it’s doing? MW: I think about the canvas as much as the paint as much as the wood. It comes back to that balance amongst the three materials. There is a large range of what canvas is—weight and weave, linen, drop cloth, cotton, wool. Each has its own color, weight, and density thereby responding to the wood and the paint in its own, specific way. The same goes for the wood and the paint. Different kinds of wood have different colors and weights and densities. Different paints have different translucencies, viscosities, respond differently to water, surface, and each other. PB: Does music or historical figures and cultural situations/problems ever figure into your work? 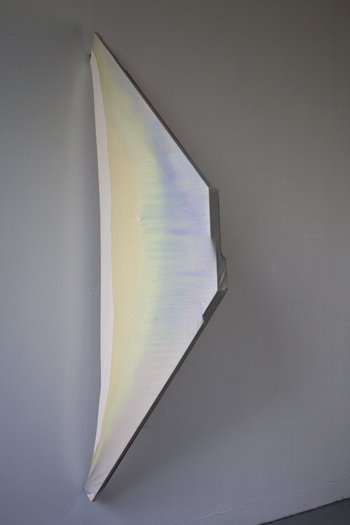 MW: I rarely make work based on these things, though they may peripherally affect the energy in the studio. I’m more likely to figure in the element of time, whether it is a particular time of year (which affects decisions about color and light), or more objectively working with the idea of documenting time in the paintings. The second idea manifests in the calendar paintings; these document a specific period of time in the studio, usually using as a basis a stretcher divided into twelfths (as in a clock or a calendar). In the spaces of the clock, I pour the leftover paints from other paintings as I’m making them. The calendar paintings become an inventory of the other work concurrently made in the studio, and also a visualized document of the specific time frame. PB: What’s on your reading/looking/listening radar lately? MW: I am nearing the end of “Within A Budding Grove”, which is the second book of Proust’s In Search of Lost Time. I love it! The book is seven books long, well over thousands of pages, so the scale of the experience of reading it is very different than any kind of reading experience. It is immersive and reflective, the language physical and descriptive… It recreates the experience of living while standing outside of that experience. Also on my radar is my work as an art therapist. I work with adolescent kids with severe mental illnesses. It is hard, exciting work that keeps me aware of humanity and my trust in art making. 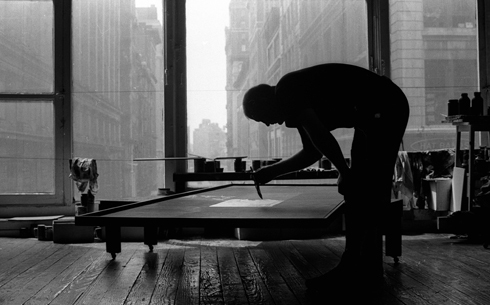 It is a great antidote to the cynicism that can come with the art world. MW: The advice I repeatedly give myself is to find my own clear sense of time. It is easy to be waylaid especially by the speeds of technology and the art world. I also say to myself: See, see, see lots of art! And: If there is a painting you want to make, make it.